There were screens sitting on every table in the chain restaurant, and we had never seen that before. Not there, not anywhere. When my sons and I sat down, I started flipping through our table’s seven-inch tablet screens that showed full-color photos of the same food in the print menus supplied to us. But there was more: We could pay $.99 to play a variety of games, order drinks, and pay our bill. “What the heck is this?” I asked. “That’s the end of human interaction,” my 17-year-old observed. 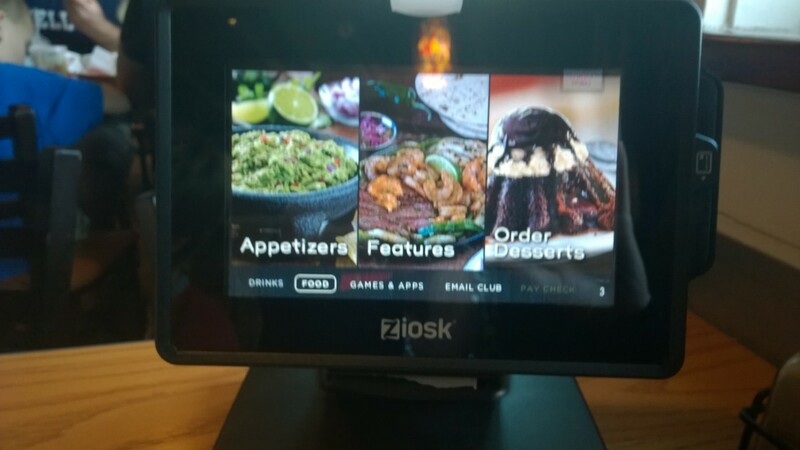 This end of human interaction is called Ziosk, and according to Dallas Business Journal, “the world’s first ordering, entertainment, and pay-at-the-table tablets” are now sitting on 45,000 tabletops in more than 1,000 restaurants in 46 states, serving 20 million guests per month. A real, live waitress appeared to take our drink orders while staring blankly out the window. I guess she was searching for the end of her job that Ziosk is poised to induce. Either that, or she’s already become accustomed to talking to people who are looking at screens instead of at her. We ordered our food, and then we turned Ziosk away from us. My son showed me a funny video on his phone, the other one announced some Premier League news from his phone, and I looked up something on the calendar of my phone for both of them. We brought our own screens, thank you very much. The Ziosk had nothing to add to our conversation, but we could have reordered our drinks through it. I could have checked Facebook on it, sharing the news that I’d ordered a Sante Fe Chicken Salad. I could even have used the Ziosk to take a picture of my food and the fun we were having looking at screens together. Ziosk automatically tags the restaurant location, so you don’t have to update your stalkers by hand. But I liked to talk to the real, live waitresses and waiters before the robot uprising is completed, wiping out their jobs. Besides, I got a text. We didn’t see that waitress much again. A different one brought us our food and still another brought us more drinks, all doing the Ziosk’s bidding. I paid for the check through the Ziosk’s credit card swiper and a got receipt printed right from the bottom of the tablet — like magic. It was the fastest table checkout I have ever had. Our waitress never said goodbye. On our way out, I noticed that just one table of people was using the Ziosk. A six-year-old kid was playing a game, putting her grubby little fingerprints and probably a germy summer cold all over the Ziosk’s shiny new screen. Everyone else, it seemed, was talking to each other. I guess the end of human interaction has only begun.